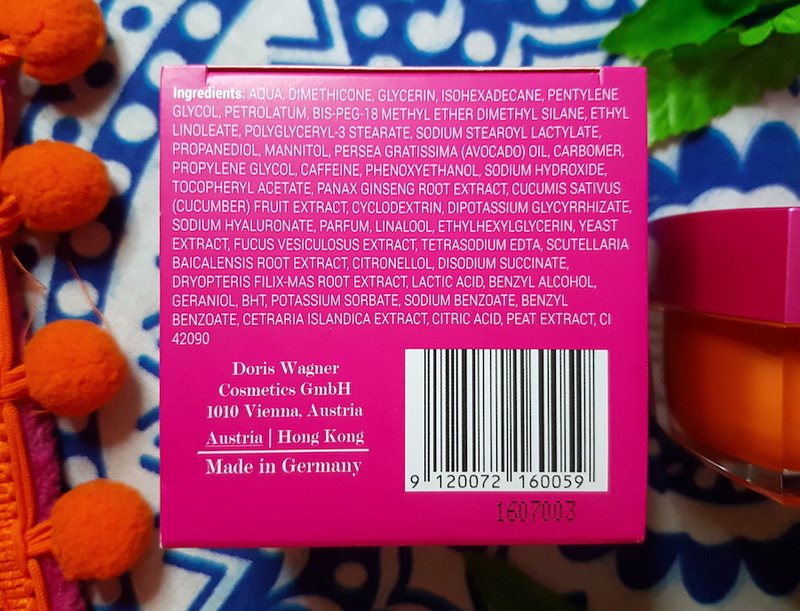 It comes packaged in a bright orange and pink screw cap jar that holds 50ml of product (more discussion on the packaging towards the end of the post). The cream is a pale green-blue in colour which instantly makes you think "fresh" and hydrating. It even has a very fresh yet relaxing scent which adds to the effect. After cleansing and toning, apply the cream to the face before sleeping. You can also use extra for an overnight mask if you wish too. You don’t need too much to cover your face, but it can be easy to use far more than you need if you dip your fingers in the jar. I would recommend using something like a spatula or a cotton swab to get the cream from the jar as not only does that mean that you use just the right amount, but it also prevents contaminating the cream with bacteria from your fingers. It sinks in fairly easily overall, but it does leave my skin feeling a little greasy upon application. This isn’t really an issue if you’re just going to sleep anyway though. Upon awakening the skin isn’t as greasy anymore and instead it looks and feels hydrated and more glowing. After just under 3 weeks of daily use, I've noticed my skin looking more even, hydrated and balanced. It has also helped to reduce any redness/post-blemish marks and to keep any blemishes more under control, so there are fewer and the ones that do come are less irritated and heal faster. Using this cream at night has not affected my oily skin in the daytime, meaning that it hasn't made it worse but hasn't overly mattified the skin either (however, the next product I shall be talking about helps more in this area, so read on if this is a concern of yours). Overall, this cream has been helping me to wake up with brighter, firmer, hydrated skin that shows less signs of blemishes and dark spots. Dry areas have been healed, over oily areas become less oily and spots less severe. Definitely a hard-worker that covers so many issues in just one cream, making it very ideal for those who also have a range of skin problems and don't want their skincare routine to be 1000 steps long! Again, quite a lot going on! 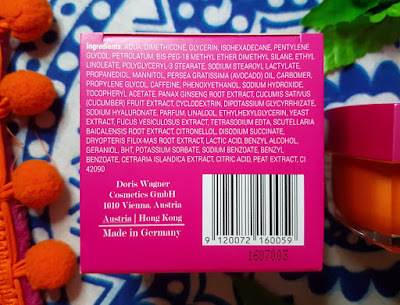 It comes packaged in a rectangular, bright orange plastic bottle with a pump dispenser and plastic pink cap. It comes in two sizes; 30ml and 100ml. The cream itself is a beige/off-white colour and has a texture that I find a bit harder to describe. It's not a thick cream, it's not really a gel, it's not watery. It is very light and has kind of a slightly bubbly, fluffy texture to it. If this makes no sense, then I apologise. It's an interesting one to try to describe. It also has a lovely and relaxing scent of cherryblossom, but it is quite a strong smell. It’s a nice smell, but for a facial cream it is a heavier scent than you may be used to. It is about as heavy as a perfumed body lotion. 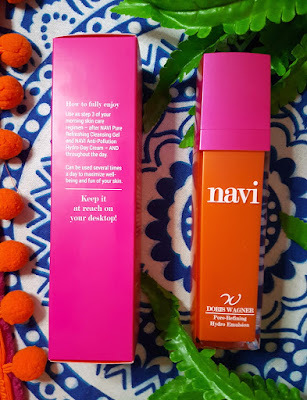 NAVI suggests using this as the last step after your moisturiser, and as often as you want throughout the day. 2-3 pumps should be enough (2 is fine for me), and you gently massage it over the face. 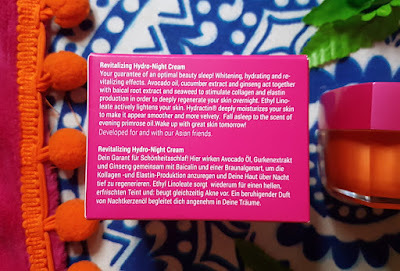 Whilst the Revitalising Hydro-Night Cream may make the skin feel a bit greasy, I find that the Pore-Refining Hydro-Emulsion helps to mattify it again. 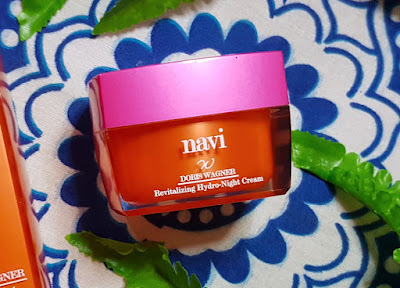 The mattifying aspect means that it’s a good product for use on oily skin with daytime wear, but I also use it at night time along with the Hydro-Night Cream. This emulsion really melts into the skin, which is lovely. As it does, it mattifies the skin into a soft-matte sort of finish. It isn't a dry matte, so the skin looks smooth, soft and balanced rather than over-dried out. Pores are noticeably smaller after use as well, and this effect can be topped up with each use throughout the day. The longer that you use the product, the longer the effect lasts too, so if you wear makeup during the day and aren't able to keep applying a cream, then you'll still notice something for sure. It isn't as moisturising as some other products, but it also doesn't claim to be. That doesn't mean that it isn't suitable for dry skin, but it's definitely something to use alongside another product for extra skincare benefits. 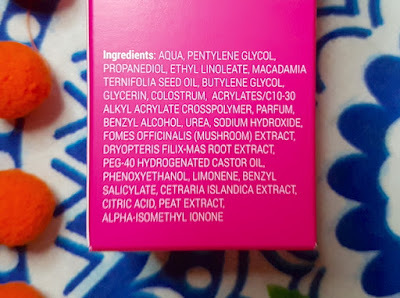 I do think that this is more worthwhile for those with oily, blemish prone skin though as people with these issues will reap more of the benefits than those with normal or drier skin. Shrinking the appearance of pores, a mattifying effect and blemishes healing faster is a great combo for oily, blemish prone skin. Whilst the colostrum was a bit of an eyebrow raising ingredient and will maybe make some of you pull back somewhat, I highly recommend giving it a go. I've been seeing great results with this cream and the pair as a duo too (which I'll discuss more in a moment), and I think that it has some more unique stuff going on. 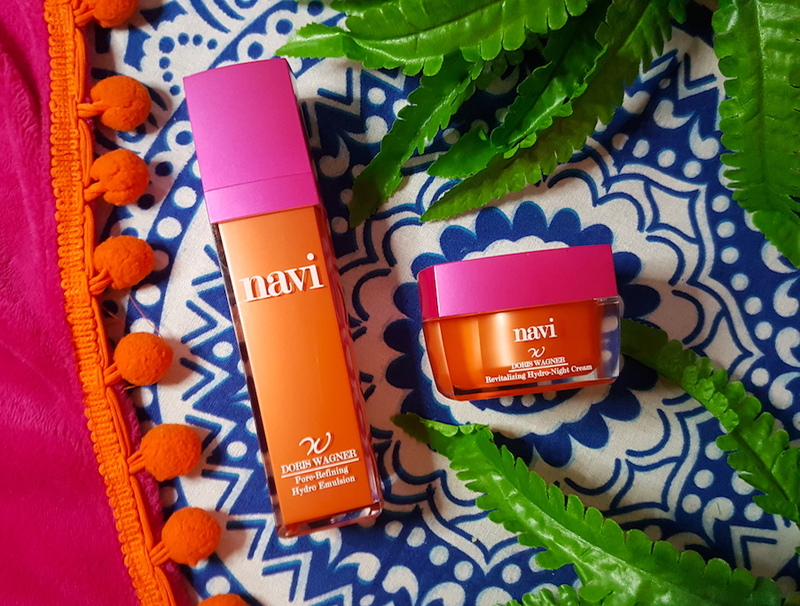 Just like the Night Cream, this is a hard-working product, and it's great for those who need something a little extra to snap their skin into gear. Definitely worth adding that one extra step into your skincare routine rather than adding a dozen serums to fix different issues instead. So let's have a quick chat about the products as a pair. I've been using these nightly for the last 2-3 weeks and I've been getting some great results. My pores have been less visible, my skin has been more comfortable and blemishes heal a lot quicker. They work really well together as well and the smells are very beautiful and relaxing before bed. I love the style of packaging for the range! I love super colourful stuff, so these fit right into my style. They are made of thick plastic, not glass, so they're not too heavy to hold. The only issue I have with the packaging with either product is that the lid for the Pore-Refining Hydro-Emulsion fits a little loosely so it can fall off easily. I’m not sure if that’s a universal issue or just a problem with mine, but I’ve had no packaging issues otherwise. If you are still on the hunt for your perfect skincare heroes, these are well worth checking out. They are great for such a wide range of skin types with an array of issues. You can purchase the NAVI Revitalising Hydro-Night Cream and Pore-Refining Hydro-Emulsion from Amazon or Wagner Cosmetics. What are your thoughts on the NAVI Revitalising Hydro-Night Cream and Pore-Refining Hydro-Emulsion? What are your favourite skincare heroes?